In my recent review of Nex Machina, I talked about how difficult it is to make a good twin-stick shooter, considering how simple the genre is. I pointed out that the key is to come up with some manner of unique selling point that elevates the game beyond simple running and gunning. This week we take a look at Demon Crystals, a frantic twin-stick shooter by Byte4Games. Does it manage to stand out? Well, let’s find out. The first thing that stands out is the game’s color scheme. The palette and lighting are very pleasant, and the game really makes use of its visuals to help craft levels. It’s got an anime-cartoon style, and it’s not as neon-heavy as some other twin-stick shooters, so that’s a benefit. As the name suggests, it has a supernatural aesthetic. Another key aspect of shooters and arcade games in general is music. That’s an area where Demon’s Crystal kinda falls flat. They have this somewhat irritating track on repeat that has a sort of Halloween vibe. I found it repetitive, and the few other tracks they tossed in weren’t much better. As for the meat and bones, it’s pretty standard top-down shooting gameplay. Essentially you run around fending off enemies and collecting powerups. The game leans much more towards the frantic style of top-down shooting, and it can quickly become overwhelming. The powerups do help you greatly. The powerups are perhaps the most interesting gameplay mechanic, as they greatly increase your firepower. Levels are a bit tricky to navigate as well, as I found myself getting stuck on random obstacles on the ground trying to collect things. This does add some fun challenge, but it also feels a little unfair at times. You really do need the powerups, as the main fire is pretty weak, so you’ll be grasping for them whenever you can. There are lots of weapon drops but they’re not that varied and only 3 or so are useful. On the whole, the gameplay really didn’t stand out much, and I found myself breezing through. The boss fights are a nice change of pace, and one in particular stayed with me. With so many quality shooters on console and PC, it’s tough to recommend Demon’s Crystals. It’s got no unique selling point, and the gameplay doesn’t really ramp up in fun or interesting ways. But it is still a solid shooter with some decent level design. This is the kinda game I can recommend more for people looking for something more casual on sale. 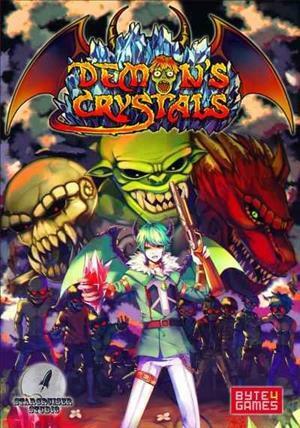 Demon’s Crystals was reviewed using a PC digital code of the game provided by Byte4Games. The game is also available on PlayStation 4 and Xbox One via online stores. We don’t discuss review scores with publishers or developers prior to the review being published. Mazen enjoys anything with over-the-top violence, dark humor and a real challenge. He’s still pretty big on single-player games and he’s always looking for new titles he might’ve missed out on, so if you know about a crazy new title that’s flying under the radar, look him up! Copyright © 2012-2018 Videogame Professional, All Rights Reserved.